The Lake Cumberland Area Development District is a regional planning and development agency based in Russell Springs, Kentucky, that serves Adair, Casey, Clinton, Cumberland, Green, McCreary, Pulaski, Russell, Taylor and Wayne counties. 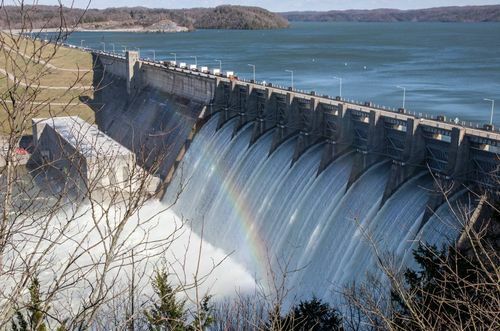 Excessive rainfall in both 2018 and in early 2019 set the stage for the record-breaking water discharges at Wolf Creek Dam and record-high water levels in Lake Cumberland that occurred in February 2019. 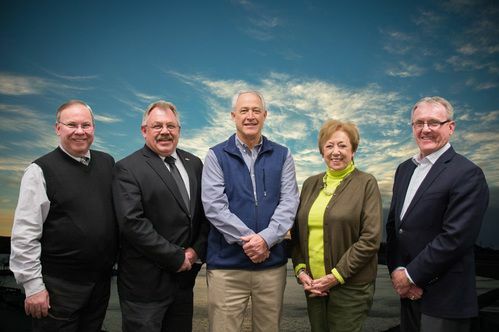 Left to right: Darryl McGaha, LCADD Executive Director, and LCADD's 2019 Board Officers, Cumberland County Judge-Executive John Phelps, Chairman; Green County Judge-Executive John Frank, Vice Chairman; Russell County Citizen Member June McGaha, Secretary; and Burnside Mayor Robert Lawson, Treasurer. Above, left: Susan Taylor, Co-Director LCAAAIL, Social Service Division, distributes chicken dinners from Lee's Famous Recipe during the Sock Hop Picnic, held May 25, 2018 in Liberty. The annual event offers a fun-filled day of games, food, music and fellowship for the senior citizens in the ten-county area. 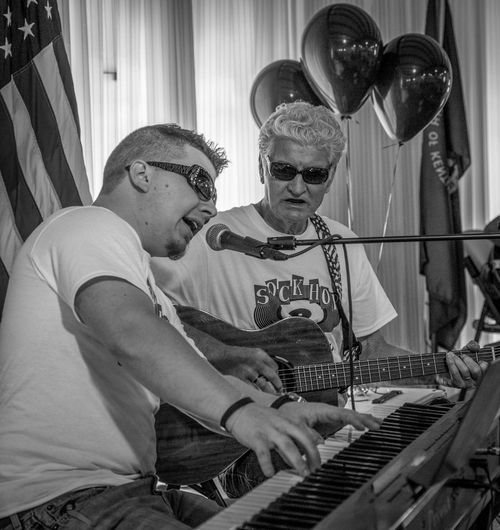 Above, right: Jordan Burks, Wayne County Senior Center Director, entertains during LCADD's annual picnic. 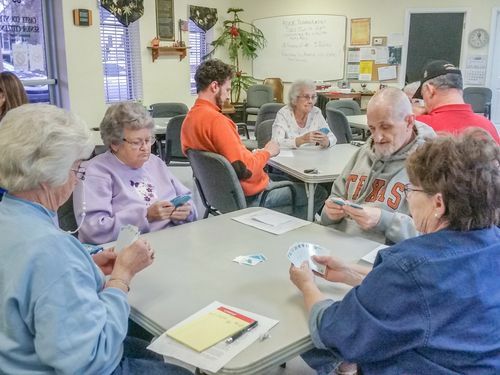 LCADD-operated senior centers offer a variety of activities for their patrons, such as this ROOK Tournament, far left, which was held at the Casey County Senior Center in Liberty. 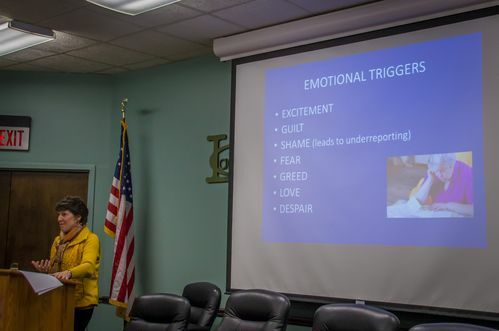 Above, left: Lori Farris, Office of the Kentucky Attorney General, was the special guest speaker at LCADD's Regional Elder Abuse Council Meeting, held January 31. Farris' presentation focused on scams that are targeted directly at senior citizens. 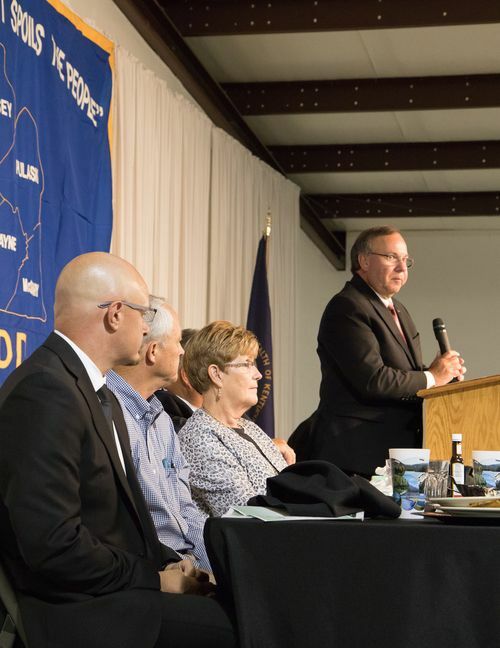 She shared information from the Office of Senior Protection, which works to educate, empower and protect Kentucky seniors. The Office of Senior Protection falls under the Families Branch of the Office of the Attorney General.